Children love stories, and so we provide them. In the contemporary West we rely on books, but this was not always our way: as long ago as 1936, Walter Benjamin’s essay “The Storyteller” lamented the passing of the art of oral narration. The ancient art of oral storytelling endures in many parts of the globe. In southeast India, for example, I sat on the floor of a Chennai nursery and listened to a story, enthralled. Here, by contrast, we buy or borrow children’s books, or take them out of the attic, and read them to our offspring. In considering a growing trend in American books for children, I find it hard to push aside the question of why children love stories. An outstanding example will serve: a Caldecott Medal-winning picture book The Three Pigs, by David Wiesner. Said to exemplify dramatic changes that are occurring in children’s cultural lives as a result of web technology, Wiesner’s book has been touted for its special appeal to the population of children known as “cyberkids,” “digital youth,” and the “net generation.” Books addressed to these allegedly postmodern children draw increasingly on hypertext and interactivity. They eschew linear plots, and favor formats that demand participation from individual child readers in various processes of active co-creation. Each book serves as an elaborate set-up for storylines that can vary not only from reader to reader but also from one reading to the next. An early groundbreaking example of this genre was David Macaulay’s Black and White, a picture book in which at least four versions of the same story are simultaneously recounted, but which may be read in any number of ways. Like a child clicking a mouse or tapping a screen, the reader of Black and White is free to move in any direction and thus to construct his or her own narrative. Not surprisingly, Wiesner dedicates his Three Pigs to Macaulay. Are the experiences offered by books of this type dramatically new? To claim as much is to risk a somewhat ahistorical perspective, and to assume that a passive receptive state is the mode with which children approach more traditional books. I am doubtful. John Dewey, Lev Vygotsky, Jean Piaget, and Jerome Bruner, all noted psychologists, have shown persuasively that children invariably construct their worlds, and indeed must do so. Mental construction may seem passive from the outside, because it cannot be directly observed, but it occurs quite actively and passionately. Out of stories and out of life, children make what they need. They select, they re-work, they re-create. We must therefore recognize that in the presence of the great classic picture books—Potter’s Tale of Peter Rabbit (1902), Bemelmans’s Madeline (1939), Sendak’s Where the Wild Things Are (1963)—children become as mentally engaged as they do with any of the post-Internet offerings. On the other hand, something is clearly new, in degree if not in kind; and the phenomenon deserves our serious consideration. More to the point, does it merit an unqualified welcome? The earliest versions of the Three Pigs story are buried in time, although we do have nineteenth-century English renderings of it. I want, as a foil, to consider Disney’s Silly Symphony animation, from 1932, with its refrain, “Who’s afraid of the big bad wolf?,” frequently issued in print form and known worldwide, because it forms, like so much of Disney’s work, an inescapable template. 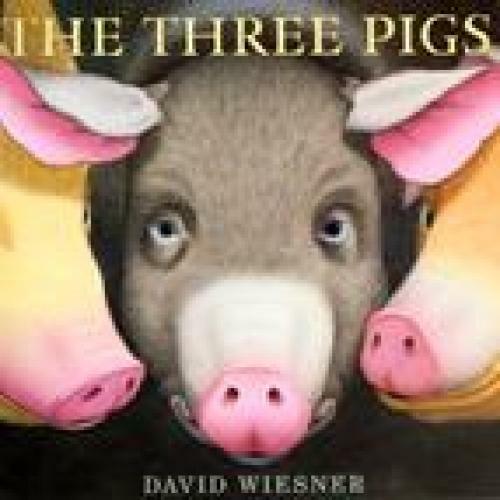 Disney’s pigs are “little,” that is, they are children; whereas Wiesner’s pigs are neither verbally nor pictorially “little.” On the book jacket, Wiesner’s three porkers zoom in and eye us. We go snout to snout with them, as if looking in a mirror. Disney’s tiny fellows, on the other hand, caper at a distance; they are comical and vulnerable in their sailor suits, except of course for the wise guy in blue working man’s overalls and cap, who, channeling La Fontaine’s La cigale et la fourmi, warns the others against frivolity. The story, as Disney tells it, conforms to Aristotelian aesthetics: from start to finish, the plot conforms to propter hoc, replete with necessity and peripeteia (an unexpected reversal of fortune), as the industrious little pig saves his brethren by turning the tables on the wicked wolf, who flees in howling agony, his bottom scorched in boiling turp. And children feel good; they smile. They have been through fear, trembling, revenge, resolution, catharsis. And all of this in a single, justly famous, work of art. Wiesner draws in several linear styles, each one of which is associated with a different thread of his layered narrative. When the story starts, his art recalls the late Victorian Walter Crane’s illustrations for “This little pig went to market.” As we read the text set neatly above the imagery, we are lulled into complacency. We are in the story we know. The wolf blows the first house down—but the threatened pig, instead of being eaten or running to his brother’s, simply exits the story altogether! He escapes danger by escaping the story. Imagine waking yourself up in the middle of a scary dream: now you are not in that story any more. The book will intrigue, delight, and puzzle children. (Where did the pig go? What is he standing on? How did the wolf really eat the pig if he goes away? Why does it say so?). Wiesner’s tale turns back on itself to reveal its form, and to show that a story can be protean, metamorphic, and infinitely malleable. We have to co-construct it. Indeed, one of its boons is that, since there is no right way to read it, adults, too, are put to the test intellectually, (Wiesner’s pigs are not just children). The book can be seen as an unexpected lesson in the ethic of storytelling. But has something been lost? Fear, after all, has been drained completely away. By letting the pigs out of the story, Wiesner has pushed us out as well. We have no need for empathy, no real worry any more about their fate, or our own, or about good or evil. When bad comes along here, you simply jump out of your story into another one: Click. Evil is therefore unreal. The pigs get away, but the wolf cannot. He exists only in the story. Unlike the pigs, he is trapped. And this is a deprivation. By eschewing an incantatory mode, by not luring children step by step into a transparent world and holding them spellbound as in a dream, this postmodern tale, artful and ingenious, wakes us up, and provides its own useful challenge to understanding. But there is a cost. The risk with the cyber-genre is that, with all its glitz, we lose the pity and terror which Aristotle extolled and Plato feared. Surely we need not make such a sacrifice. Think of Ovid, after all, with his Orpheus, Icarus, Daphne, and Phaeton: he did not write for children, but he proved forever that you can glide from story to story without losing the quiver, the throb, the core. Whatever the achievements of much new work in the field of children’s books—of David Wiesner’s work in particular—I confess that I am still on the lookout for those rare treasures that can make us tremble mightily like Disney’s giddy piglets under their blanket when the wolf is at the door. Ellen Handler Spitz is Honors College Professor at the University of Maryland (UMBC). Her forthcoming book, Illuminating Childhood, will be published next fall. She will write regularly about children’s literature for The Book.